For decades, dietary guidelines have instructed us to eat a “low-fat” diet. The way this diet is defined, is that fat is supposed to be around 30% of calories. Many studies have shown that this diet is ineffective in the long-term. The largest and longest studies show only tiny reductions in weight, and no effects on heart disease or cancer risk (1, 2, 3, 4, 5). However, many proponents of low-fat diets claim that such a diet is highly flawed, because it isn’t low-fat enough. Many scientists and doctors who study low-fat diets claim that it needs to be around 10% fat in order to work. As with low-carb diets, the difference between 30% and 10% can be massive. 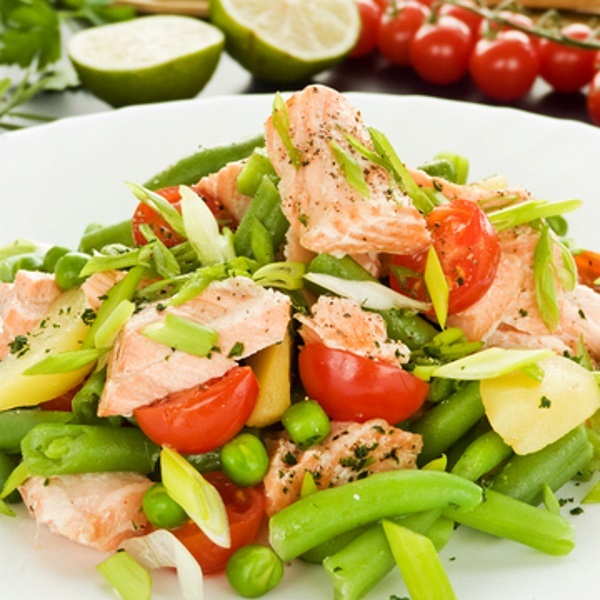 This article takes a detailed look at “ultra” low-fat diets and their health effects. What is an “Ultra” Low-Fat Diet? An ultra low-fat, or very low-fat diet, is a diet that contains 10% or less calories from fat. It also tends to be low in protein (10%) and very high in carbs (80%). Ultra low-fat diets are mostly plant-based. They limit the intake of animal products, such as eggs, meat and full-fat dairy (6). They also tend to limit high-fat plant foods that are generally perceived as healthy, including extra virgin olive oil, nuts and avocados. This can be problematic, because fat serves several important functions in the body. It is a major source of calories, helps build cell membranes and hormones, and helps the body absorb fat-soluble vitamins like vitamins A, D, E and K.
Additionally, fat makes food taste good. A diet that is very low in fat is not as pleasurable as a diet that is moderate or high in fat. All that being said, studies show that an ultra low-fat diet can have very impressive benefits against several serious diseases. Bottom Line: An ultra low-fat (very low-fat) diet provides less than 10% of calories from fat. It limits the intake of most animal foods and even eliminates healthy higher-fat plant foods like nuts and avocados. In 1939, a man named Walter Kempner developed a special diet, called the Rice Diet, to treat patients with high blood pressure and kidney disease (7). This tasteless diet, consisting mainly of white rice, fruit, fruit juice and refined table sugar, also had surprising effects on other serious health conditions. Kempner was only the first of many to research the effects of ultra low-fat diets on health. Other well-known low-fat proponents include Roy Swank, Ancel Keys, Nathan Pritikin, John McDougall, Caldwell Esselstyn and Dean Ornish. Bottom Line: In the 1930s, Walter Kempner was the first to research and document the benefits of ultra low-fat diets. Many researchers have since followed in his footsteps. Ultra low-fat diets have been studied against several serious diseases, including heart disease, diabetes, obesity and multiple sclerosis. Here is a summary of the findings. High blood pressure (8, 9, 10). High blood cholesterol (8, 10, 11, 12). High C-reactive protein, a marker for inflammation (8, 13). One study of 198 patients with established heart disease found particularly striking effects. Out of the 177 patients who followed the diet, only 1 patient experienced a cardiac event (stroke) (14). However, 13 of 21 (62%) of patients who didn’t follow the diet experienced a cardiac event. Bottom Line: An ultra low-fat diet can improve several risk factors for heart disease, including high blood pressure and high cholesterol. It may also decrease the risk of heart attacks and strokes. Several studies have found that very low-fat, high-carb diets can lead to improvements in patients with type 2 diabetes (15, 16, 17, 18, 19). Diabetics did very well on the rice diet. In fact, one study found that 63 of 100 patients decreased their fasting blood sugar levels (20). What’s more, of the 72 patients that were dependent on insulin before the study, 58% of them were able to reduce or stop insulin therapy completely. Another study found that eating an ultra low-fat diet may be even more beneficial for diabetics who are not already dependent on insulin (17). Bottom Line: Eating an ultra low-fat diet may have benefits for patients with type 2 diabetes, especially those not already dependent on insulin. People with obesity may also benefit from eating a diet that is very low in fat. Kempner used a form of the rice diet to treat obese patients with impressive results. In one of his studies, he collected data from 106 massively obese patients and found that, on average, they lost 140 pounds (21). That’s not what you might expect from eating a diet mainly consisting of refined carbohydrates. Bottom Line: Obese people may also benefit from eating an ultra low-fat diet. One study of 106 people documented tremendous weight loss success. Multiple sclerosis (MS) is an autoimmune disease that affects the brain, spinal cord and the optic nerves in the eyes. People with this disease may also benefit from an ultra low-fat diet. In 1948, Roy Swank started to treat MS with a regimen he called the Swank diet. In Swank’s most famous study, he followed 150 MS patients for over 50 years. The results indicated that an ultra low-fat diet slowed the progression of MS (22, 23). After 34 years, only 31% of those who stuck to his diet had died. On other hand, 80% of those who failed to follow his recommendations had died (24). Bottom Line: One study reported that MS patients eating a diet very low in fat lived longer, compared to patients not following the recommended diet. Why Do Ultra Low-Fat Diets Work? Exactly how or why ultra low-fat diets improve health is not very well understood. Some argue that the blood pressure lowering effects may not even be directly linked to eating a low-fat diet. The rice diet, for example, was extremely low in sodium. Additionally, the diet was highly monotonous and bland, with a low “food reward” value. This may have caused the participants to unintentionally reduce their calorie intake. Cutting calories tends to have major benefits for both weight and metabolic health, no matter whether you are cutting carbs or fat. Despite being high in carbs, ultra low-fat diets are also able to improve insulin sensitivity and blood sugar control in some people. Bottom Line: It is not fully known why ultra low-fat diets have these powerful health benefits. It may be related to drastically reduced calorie intake. An ultra low-fat diet may help treat some serious diseases, including diabetes and heart disease. But, in the long run, following a strict diet very low in fat is extremely hard. It is not very enjoyable to eat this way, and the diet lacks variety. You may also have to limit your intake of some very healthy foods, including unprocessed meat, fatty fish, eggs, nuts, extra virgin olive oil and full-fat dairy. So, while this diet may benefit certain people with serious health conditions, it isn’t likely to go mainstream anytime soon. If you are interested in reading more, then check out Denise Minger’s YouTube presentation and detailed blog post on the subject. I got much of the information for this article from her material.